Experience Real Alaskan Dog Mushing! The Alaskan Dog Mushing School is so much more than a dog sled ride. First you’ll gear up in warm dog mushing gear. Next you’ll meet and learn about our eager and friendly Alaskan huskies, the hearty dog breed favored by long-distance mushers. Then you’ll learn to harness a team and hook them up to the dog sled. As you hit the trail, you’ll discover the joy of dog mushing on beautiful forested trails. 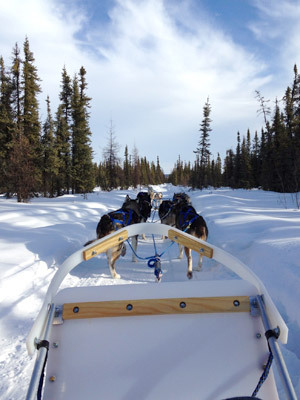 Your experienced musher will teach you to ride the dog sled runners and drive the dog team. The fully immersive 2-hour Alaskan Dog Mushing School is a wildly popular dog sled tour. It’s perfect for those who would like more than a dog sled ride and spend more time with the dogs. More Alaskan Dog Mushing Tours! A must if you are in or around Fairbanks and love dogs, the outdoors and experiencing something truly remarkable. The trails are well groomed and so, so, so beautiful. Eleanor is an amazing person – be sure to try the Mushing School and enjoy ! I loved every minute of it. Eleanor and her team at Just Short of Magic were amazing. It was everything I hoped it would be. We all had the most enjoyable experience. I definitely recommend you use Just Short of Magic for your dog sledding fun in Fairbanks.